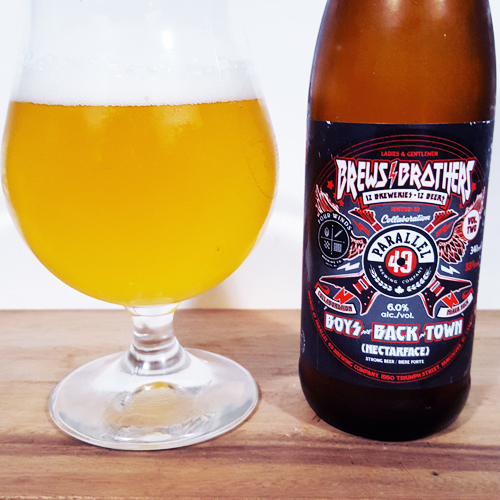 Parallel 49 Brews Brothers Vol 2: This year’s Classic Rock themed Brews Brothers Vol 2 twelve pack is a large multi-brewer BC pack of craft beers featuring a whole different set of breweries from last year’s collaboration pack, which was once again were brewed together at the Parallel 49 brewery in Vancouver, BC. Volume 2 retails for $25-$30 in stores and at the time of posting, is still readily available for purchase so I encourage you to grab one before they are sold out. I highly recommend picking one of these up just for the unique opportunity of trying 12 brand new beers from 12 different breweries in a single purchase for such a low price. 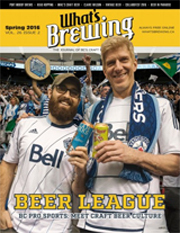 Okay it’s technically 13 brewers if you count Parallel 49, so we’ll call it a brewers dozen I guess. 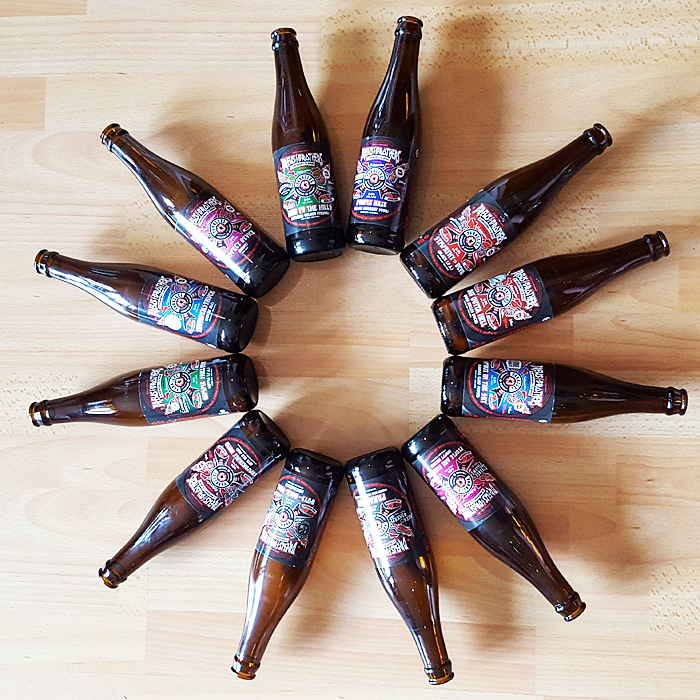 A Little Bit About Brews Brothers II: With a mixed 12 pack like this, one can only imagine the hectic brewing schedule, recipes, ingredients challenges and overall coordination needing to happen to get this to market in a reasonably fresh state for your drinking pleasure. Doing this isn’t easy, it takes a lot of planning and coordination and everything has to go right for it to work perfectly. 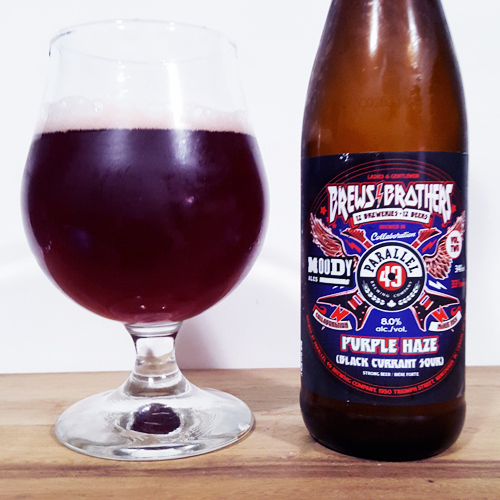 Each brewer visited Parallel 49 on their brewing day to make their collaboration beer, which was inspired by their brewing styles and of course the classic rock song of their choice that was likely blaring through the brewery while they brewed. As you can see from one of their many Facebook pictures below, they obviously had lots of fun with it despite the hectic schedule. My Overall Impression: I would buy this pack every single year just to try all the new beers since no single beer is quite the same as the regular beer line up of any of the breweries involved. I truly appreciate the fact that they all got creative with it, even if I didn’t love every beer the experience is totally worth it. With a collaboration pack like this I am always looking for variety, quality and freshness, so I truly felt that they delivered fairly well on that front. Admittedly, I think I liked last year’s version slightly better from a taste perspective, however I thought this year they had more interesting styles of beer, so we’ll call that a trade off. Some of the beers were great, some were decent to good and there was only one stinker in the bunch. Here are my detailed thoughts and reviews of each offering in alphabetical brewery order from the pack that I purchased shortly after release. Paranoid: A collaboration with Axe & Barrel Brewing in Langford, this was a 8.5% abv Oaked Wild Imperial Pilsner that was made using Lager and Sake yeasts, Chardonnay and Sake soaked oak spirals with wild Brettanomyces strains for added fun. Aroma and Appearance: It pours a copper gold colour with one finger of white foam and an average carbonation level. The aroma is cherry tartness, oak, white grape juice and hints of horse blanket. Flavour: Hay up front, cereal malts in the middle and oak horse funk on the finish with dirt in the middle and something akin to chips of soap throughout that just didn’t taste quite right. Overall Impression: .Untappd was all over the map on this one, so it’s hard to say if this was bottle variation or was one that simply didn’t work for me. Rating: Terrible at 2/10, it went down the drain after I tried a few sips at different intervals over 10 minutes in hopes that it would improve, but it didn’t so I gave it two points for trying and this was clearly my least favourite beer in the pack. 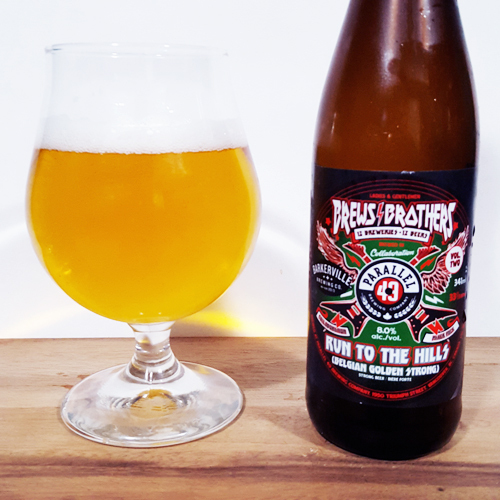 Run to the Hills: A collaboration with Barkerville Brewing in Barkerville, who distributes beer to the the lower half of British Columbia regularly, this was a Belgian Golden Strong style beer brewed to a strength of 8.0% abv. Aroma and Appearance: Pours a clear gold colour with one finger of white foam and a fairly strong carbonation presence. The aroma features light hints of pear, coriander and a touch of cereal grains. Flavour: Light cereal grains up front, with notes of hay, pear and an unfortunate subtle oily butter popcorn texture (how I perceive diacetyl) that was saved slightly by some mild cloves on the finish. 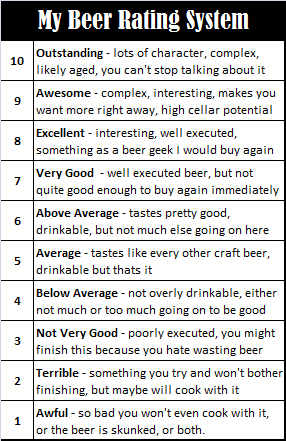 Overall Impression: It was certainly not my intention to list the two beers I liked the least first, it just seemed to happen that way due the alphabetical sorting. This was drinkable, but missed the mark for me. Rating: Below average at 4/10, drinkable but some subtle off flavour gets in the way. 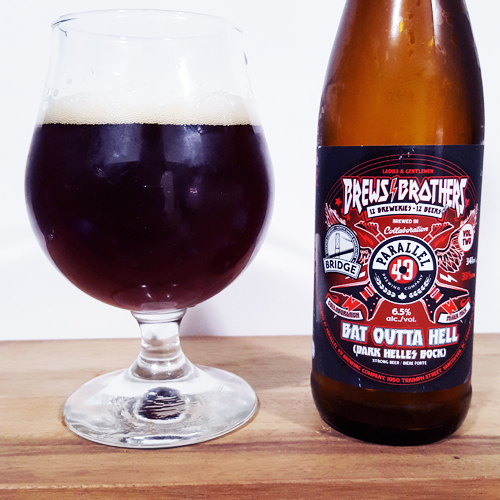 Bat Outta Hell: A collaboration with Bridge Brewing in North Vancouver, this is a dark Helles Bock lager style beer that was brewed to a strength of 6.5% abv and works as great style for the name of the beer! Aroma and Appearance: This beer pours a dark ruby brown colour with a small layer of foam and no visible bubbles. The aroma is brown sugar, bread pudding, dried dates and plum. Flavour: Brown bread and plums up front with hints of almonds and leather in the middle followed up by a crisp texture and anise spiced finish. Overall Impression: It was ok, I was kind of yearning for a bit more molasses or brown sugar in the flavour but otherwise it was ok. Rating: Average at 5.5/10, nothing particularly against it, but I was hoping for a bit more that’s all. Comfortably Numb: A collaboration with Category 12 Brewing in Victoria, this Rye Old Ale was brewed to a strength of 9% abv and include some Brettanomyces yeast in it for good measure. Unfortunately, all of my pictures of this beer turned out blurry, so perhaps I too was a bit too comfortably numb when try to capture a photo. Seriously, I even did retakes and the result was the same despite looking ok on a smaller screen! Aroma and Appearance: Pours a brownish amber colour with a small layer of foam and no visible bubbles. As it warms, notes of plum, toffee malts, leather and strawberry arise from the glass in a rich and balanced manner. Flavour: It erupts with huge sweet toffee notes up front, with a rich molasses, sugar and cherry middle that settles into a leathery prune finish that’s quite savory and delicious. Overall Impression: This was a really nice and savoury beer that showcased what a true old ale should taste like. It could be cellared quite easily and is one I’d consider stocking up on. Rating: Excellent at 8.5/10, my favourite of the entire box no question. 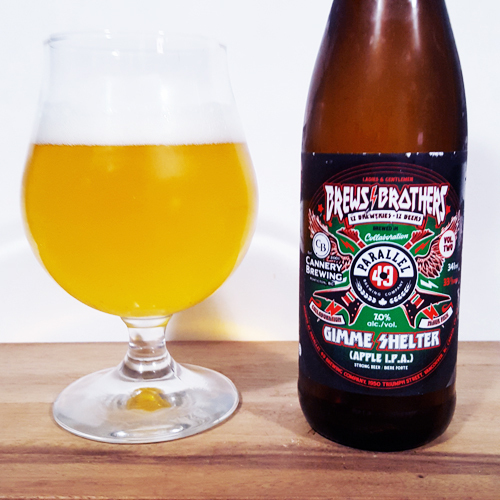 Gimme Shelter: A collaboration with Cannery Brewing in Penticton, representing the Okanagan region of British Columbia, this beer is an Apple IPA featuring what they refer to as “apple tinged” wheat malt in the mash. Aroma and Appearance: It pours a clear yellow golden apple juice colour with one finger of white foam and an average level of carbonation. The aroma is a mix of honey sweetness, tropical mango and papaya fruits, with of course a strong apple juice presence throughout. Flavour: There’s lots of apple notes up front, much like a cider, with hints of bready malt followed by a mild grapefruit bitterness and dry cider like finish that almost overshadows some minimal pine resin on the aftertaste. Overall Impression: Better than I expected, it still tastes like apple juice for the most part and is not something I gravitate towards normally, but it was fun to try nonetheless and was refreshing. Rating: Above Average at 6/10, stylistically challenging for me but they executed it fairly well for what it was and I could see the appeal, from a certain point of view anyway. Suspect Device: A collaboration with Crannog Ales in the small town of Sorrento, this unique and ancient ale is referred to as Gruit, which in this case features Juniper, Heather and Ginger spices in the place of traditional hops. I was thrilled to see a Gruit in this box, they are so rare to find and so interesting to drink. Many ancient brewers used ingredients other than hops to counterbalance the sweetness (and likely sourness) of the fermented malt and Gruit was a common name for a mix of herbs used in brewing. Aroma and Appearance: It pours a dark ruby amber colour with a small foam layer and no visible carbonation. The aroma is very herbal accompanied by fresh flowers, mild potpourri, bits of juniper and finally raspberries. Flavour: Fruity at first, it starts with some nice raspberry notes followed by toffee and honey sweetness before the ginger and heather sneaks in to dominate the middle of the beer. It finishes with soft notes of strawberry and juniper berries while tasting like fresh flowers on the aftertaste. Overall Impression: This beer tastes a lot more like a good mead than a beer, but it is still a nice and interesting offering. Rating: Very good at 7/10, totally worth a try and a good option to explore during hop shortages. 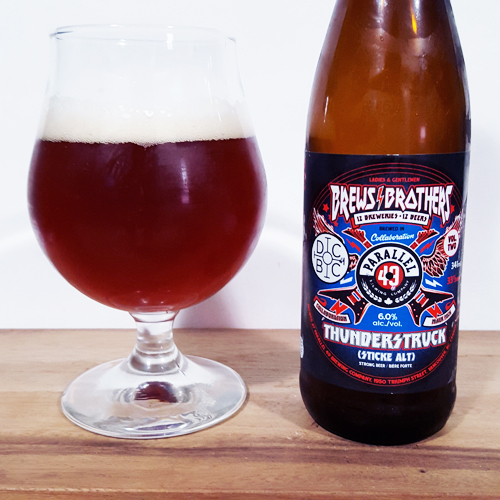 Thunderstruck: A collaboration with Doan’s Brewing in Vancouver, who deservedly won Rookie of the Year at the BC Beer Awards in 2015, this Sticke Alt variant Altbeir is named after one of my all time favourite songs and is brewed to a strength of 6.0% abv. 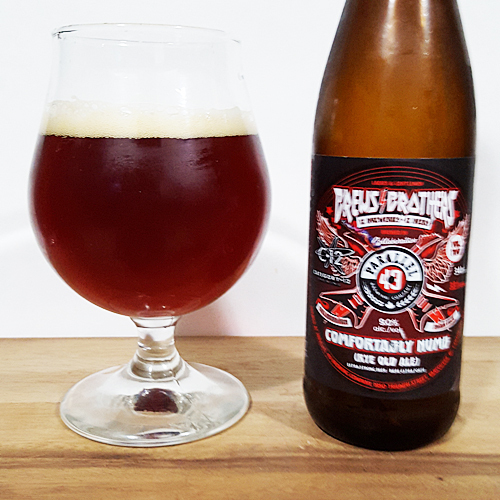 Aroma and Appearance: This beer pours a ruby red colour with one finger of foam and just a few visible carbonation bubbles. The aroma is toffee, brown sugar, dried dates and fresh raisin bread. Flavour: It’s a fairly simple well balanced beer featuring notes of toffee, plum and leather mixed in with a soft mouth feel that showcases nuances of sweet raisin bread. Overall Impression: I still enjoyed drinking the beer, but was wishing for just a little more malt presence to make it even better. Rating: Above average at 6.5/10, it is a nice easy drinker after a long workday. Spirit in the Sky: A collaboration with Fernie Brewing in Fernie, representing the Kootney’s region of our province, this 6.5% Stout included oak spirals aged in 7 year old Havana Club rum to add some extra flavour to the brew. Aroma and Appearance: Pours a medium brown colour with a thin layer of beige foam and minimal carbonation. The aroma was primarily prunes and plums with notes of dark chocolate, raisins and booze. Flavour: It starts off with some prominent dark chocolate notes followed by brown bread and overripe fruit and a boozy middle with spots of black currant here and there. On the finish, it showcases toffee sweetness, plums and prunes that facilitate a drying sensation on the aftertaste. Overall Impression: I enjoyed the creative approach to this beer, it was a great way to infuse some new flavours into a typical Stout style of beer making it very unique. Rating: Very good at 7/10, as it was an interesting, fairly well balanced beer. Boys are Back in Town A collaboration with the already famous Four Winds Brewery in Delta, this 6.0% abv collaboration was described as a brain child resulting from a combination of Parallel 49’s Jerkface 9000 Wheat and Four Winds Nectarous dry hopped kettle sour beer. Aroma and Appearance: Nectarface pours a yellow gold colour with a small layer of foam and oddly enough no visible carbonation. The aroma was very fruity, featuring peaches, pears, nectarines and papaya with hints of wheat. Flavour: This sour beer is quite puckering up front with lots of nectarine tartness initially before notes of apple cider vinegar arise in the middle. It ends with a distinctive lemon warhead and sour key candy finish, leaving just a hint of wheat texture on your palate during the aftertaste. Overall Impression: Many people thought this was the best of the bunch and I agree it was certainly up near the top. Rating: Very good at 7.5/10, cheers to another creative and interesting tasting beer from this collaboration box. Sympathy for the Devil: A collaboration with Hearthstone Brewery in North Vancouver, this darker IPA is made with roasted barley to give a roasted grain flavour and dark colour to an IPA. It was brewed to a typical IPA strength of 6.5% abv. Aroma and Appearance: The dark IPA pours a very dark brown colour with one finger of tan foam and lots of visible carbonation near the foam line of the glass. The aroma was grilled grapefruit, roasted oats, orange and lemon citrus with quaffs of tropical mango. Flavour: This beer is full of roasted grains up front with some lemon citrus notes on the side and a creamy textured middle that tastes a lot like an oatmeal stout. It has a finish consisting of grilled grapefruit, soot and resinous pine that’s present but not overpowering on the aftertaste. Overall Impression: Although it’s skewed more towards a stout than an IPA stylistically, this was a pretty nice and enjoyable beer. Rating: Very good at 7.5/10, one of the better versions of this style out there as I find that many are over hopped and way out of balance. Purple Haze: A collaboration with Moody Ales in Port Moody, in a brewery district that will soon feature four breweries all within a few steps of each other, this black currant Sour Ale is brewed to a strength of 8.0% abv. Aroma and Appearance: As pictured above, it pours a ruby red and purple colour with minimal foam and a normal level of carbonation bubbles. The aroma is black currants (duh!) and strawberries with whiffs of concord grapes. Flavour: Initially it throws off some mild apple cider vinegar sourness with under ripened blackberry tart notes before moving into a medium bodied, over ripened fruit funkiness. As it finishes, subtle and rich black currant expressions break through while it goes down the throat and pinot noir grapes dominant the aftertaste. Overall Impression: I thought this was a really nice beer in that it didn’t rely on massive souring to express its flavour, but rather showcased the currants in a more softer, more rich manner. Rating: Excellent at 8/10, the subtle currant and richness of this beer really helped elevate its status in the collaboration pack. 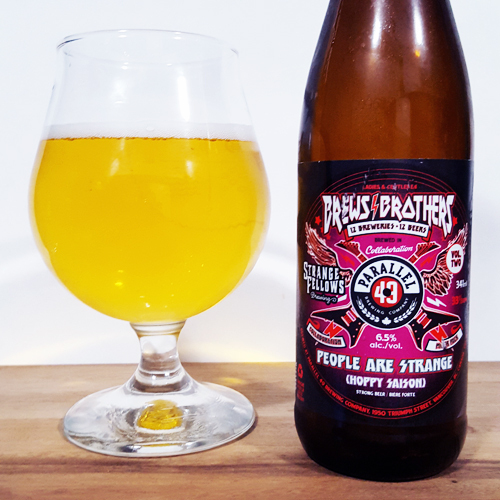 People Are Strange: A collaboration with Strange Fellows Brewing in Vancouver, this Hoppy Saison style beer was brewed to a strength of 6.5% abv featuring Opal hops and a farmhouse yeast strain. Aroma and Appearance: Pours a clear golden colour with one finger of foam and some sporadic bubbles in the glass. The aroma features whiffs of lemon, passion fruit, mango, honey, hay and grass. Flavour: It starts off with a distinctive lemon flavour up front with some hay malt and a grassy middle before moving into a floral, herbal and slightly bitter finish. Overall Impression: I thought it was an interesting attempt to combine flavours that didn’t quite marry together perfectly, but was otherwise good. Rating: Above average at 6.5/10, not quite up there with the best of the pack but still good for drinking on any given day. What did you think? Which pack was better, this year’s, last year’s? Did you have a favourite this year? Please leave a comment and let me know what you though of this year’s collaboration pack.